Professor Zoe Trodd, Director of the University’s Rights Lab joined organisations from across the region on Anti-Slavery Day (18 October) to launch a joint pledge to make Nottinghamshire free of modern slavery. Nearly 4,000 victims are identified as potential victims of modern slavery in the UK each year. The Home Office estimates the number of slaves in the UK at 13,000 and new global figures launched by the United Nations put the number at 40.3 million slaves worldwide. In Nottinghamshire there have been a number of high profile prosecutions of groups who have been exploiting vulnerable people but more needs to be done to end modern slavery. The campaign will ask the public to be alert to signs of modern slavery, to report anything they think is suspicious and for businesses to do more to raise awareness of modern slavery and to know more about where their employees come from as well as the materials for their production lines. The Modern Slavery Helpline has also been set up for the public to call if they see anything suspicious, the dedicated number is 08000 121 700. The Rights Lab at the University of Nottingham has been examining how communities can become slavery free, as part of a five-year commitment to delivering world-leading research that helps to end global slavery by 2030. Professor Zoe Trodd said: “There are 40 million slaves alive today, and tackling that global number will require coordinated and creative local action. Our University of Nottingham research programme – Slavery-Free Communities, part of the Rights Lab beacon of excellence, has been working to help bolster the evidence base and theory underpinning local antislavery initiatives. L-R – John Robinson, Chief Exec of Gedling Borough Council, Bishop Paul Williams, Paul Broadbent and Ian Waterfield from Gangmasters and Labour Abuse Authority, Professor Zoe Trodd, Paddy Tipping, Jon Hammond, DCI Nick Waldram and Kathryn Taylor from the Salvation Army. 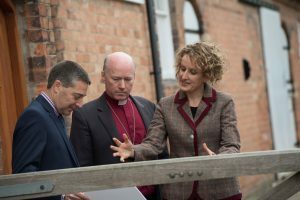 The Bishop of Nottingham, Paul Williams has also backed the campaign along with The Salvation Army who have launched their own appeal to spot the signs of modern slavery, a crime that can be hidden in plain sight. Bishop Paul Williams said: “It is deeply shocking that in the 21st Century millions of people around the world are still pressed into the horrors of slavery, even here on our own doorstep in Nottinghamshire. “The knowledge that churches and faith communities have of their local neighbourhoods means that if we come into contact with victims it is vital that we are able to recognise the signs and know what to do about it – this may be the only chance a vulnerable individual has of being rescued. Paul Broadbent is Chief Executive of the Gangmasters and Labour Abuse Authority (GLAA), a national law enforcement and licensing agency which tackles labour exploitation. He said: “It’s difficult to comprehend that modern slavery, forcing people to work, trading men, women and children as commodities – these practices are abhorrent yet they are happening right now in a street or community near you. “We need people to become more aware of labour exploitation; we want them to recognise the signs so they can report any concerns to us or by using Crimestoppers or the Modern Slavery helpline.